It’s not hard to guess the theme of this great looking slot machine from the SkillOnNet casino suit. 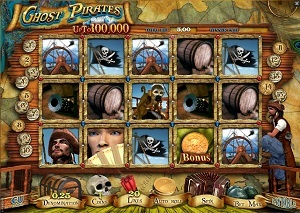 You’re in the company of pirates in this 5 reel and 20 pay line slot. Ghost Pirates really brings out the adventurer in the player and it’s hard not to think about a certain pirate blockbuster movie series when you hit the reels on this one. SkillOnNet has created a great adventure filled with action packed bonus games, cool symbols and very entertaining characters. There is no reason to be bored and drowsy when you easily can login and experience some great adventures with the Ghost Pirates slot from SkillOnNet and have a chance to take down a jackpot of 100,000 casino credits! The background of the game window is something really nice that SkillOnNet has managed to incorporate into this slot machine: a nice art painting of a pirate ship in the middle of a storm. This sort of design makes the theme and atmosphere peak when playing the game. The game window itself carries the reels on a treasure map which also adds to the great gaming environment. The colouring is wooden brown and the design of all symbols that appear on the reels are all very detailed. The sound is also very suitable for this slot machine. You can easily state that the graphic and sound are 100% in consistency with the theme. The scatter symbol in Ghost Pirates is a symbol of a man and a woman. If you hit 3, 4 or 5 of these on the reels you will be rewarded with 5, 10 or 20 free spins. There are also several bonus symbols that will trigger the bonus games. These are the Target Practice symbol, the Pirate Coin symbol and the Key symbol. You can also switch game mode, between Ghost and Pirate mode, by hitting the Ghost and the Pirate icon. The jackpot is won when five Diamond Treasure icons appears in a row. The lower paying symbols are a few different characters and some typical pirate gadgets like the flag and a parrot. All three bonus symbols will trigger a different bonus feature. The Target Practice symbol will unlock the Blades & Daggers bonus game if you manage to hit three Target Practice symbols. If you hit three Pirate Coin symbols you will trigger the Heads or Tails bonus game. The third bonus feature is triggered by five Key symbols. When you hit three Key symbols you will unlock the Lucky Door symbol. You may bet on 20 pay lines that covers all 5 reels in this slot machine. Your betting preference is easily configured from the buttons in the lower part of the gaming window. « More slotmachines guides Article last updated: Monday, July 02, 2012.